A transcendent ceremony took place on Friday, February 18th, at the Catholic church of Las Palmeras. 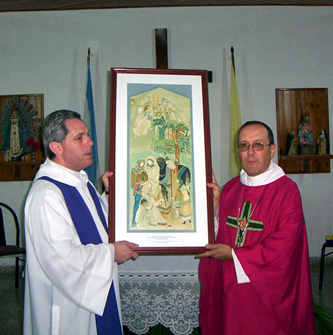 During the meeting the Diocesan Bishop Carlos M. Franzini delivered to the parish priest of Tacural, Jorge Buchitari (who is in charge of the Las Palmeras temple), the present that Baruch Tenembaum gave to him on the centennial of that town. It is a unique painting in which the fresco that the renowned Argentine artist Raúl Soldi painted in 1968 in the Annunciation Basilica of Nazareth is reproduced. The ceremony was attended by followers of both the Catholic and Jewish creeds. A letter sent by Father Horacio Moreno, a Catholic priest who is the president of the International Raoul Wallenberg Foundation, was read during the mass. Providence has blessed me with this extraordinary opportunity on which my friend, Bishop Carlos M. Franzini, will deliver to the Church of Las Palmeras the painting ”Basilica of the Annunciation, Nazareth”. Baruch Tenembaum is the prodigal son of this town. He has also been my friend, my mentor and brother for the last 40 years. Here it is where he was born and brought up, where he worked, studied and dreamt, and from where he made our blessed Virgin known all over the world. Let me add that our dear friend Baruch always underlines firmly -and I can assure that this is so- his doubtless Jewish identity, backed by an intellect full of knowledge of his People. Based on the belief that we all must love and respect each other, Baruch personally endeavored to make his dream come true, the dream of having a painting set up in the most important church of Nazareth, where our Lord spent his early years, and which is amazingly depicted in the canvas which our beloved Bishop Carlos M. Franzini is delivering today to the People of Las Palmeras. With the aim of fulfilling his dream Baruch traveled to the Holy Land together with Raúl Soldi, with whom he stayed during the 30 days’ work needed to create this wonderful piece of art. The circle is being closed today, with a son of the Jewish colonization -perhaps the only one who headed seminars and cultural institutions, and was honored with international decorations- who returns to his home town with a message that, in his own words, reflects the Jewish woman most widely known along our History, the blessed Virgin Mary. Brothers and sisters of Las Palmeras: On this occasion I will not omit mentioning that Baruch himself personally undertook the task of rebuilding and reopening the local Synagogue. Spirit has therefore overcome matter. Las Palmeras is receiving today the blessings of Heaven and it is in the midst of this atmosphere that I send my embrace to Father Jorge Buchitari, to Bishop Carlos Franzini, to the Jewish men and the Jewish women, to the Christians, and even to those who lack faith. May God bless these lands.